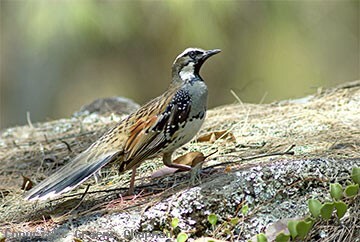 Unless you are lucky enough to see one cross the track as you drive through the forest you aren't likely to see a Spotted Quail-thrush on a casual birdwatching outing. They are very shy and always see you before you see them and run away to hide behind a bush or whatever. 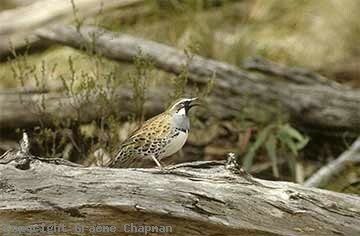 They live in permanent territories in the forest and forage entirely on the ground amongst the grass tussocks, logs and rocks. Lightly forested areas on rocky slopes and hillsides are ideal places to find them but they do inhabit a variety of forests with a fairly open understorey. 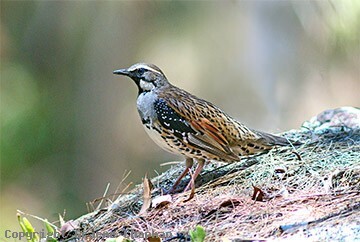 Your best chance of finding them is in spring when the repeated piping song of the male (listen on sound page) carries well through the forest as he sings from some slightly elevated perch up to 5 m or so from the ground. 436201 ... 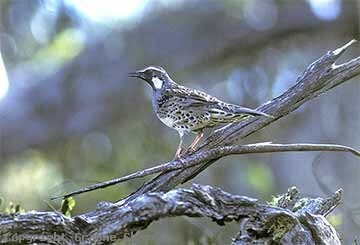 Spotted Quail-thrush, adult male.